Nikoi Island is a 15 hectare private island in the Indonesian Riau Archipelago, 8km off Bintan, a 50 minute high speed catamaran ferry south east from Singapore. In an enclave of tropical islands, coral reefs and equatorial rainforest, it was here founder Andrew Dixon would bring his young family to explore. The name Nikoi is a local variation of the Hokkein word for papaya (paw paw) – a fruit that was originally grown on the island. There is little recorded history but shards of pottery and coins have been dug up to indicate the island was inhabited around the turn of the 20th century and possibly earlier, and possibly as a trading post on the trade wind route between China and India. From the owners’ jetty on Bintan, via speed boat trip, to pitching up on the sand for a stay on this private island for the weekend, this is island fantasy in reality: Two thirds is preserved as a sanctuary and covered in virgin rainforest with a hill in the centre of the island. You can walk all around - half the circumference is beautiful sandy beach, the other half stony bluff, probably only watched lazily by harmless monitor lizards. Weather is tropical and similar Singapore, although being an island slightly cooler and typically not as humid. Just 1 degree north of the equator, the temperature rarely varies outside 26C to 32C or the water temperature 28C. This is luxury of indulgence in a unique place, based on back-to-nature escape, space and privacy, such exclusivity meaning it’s both a romantic dream for couples and regularly taken over in its entirety by groups of friends or families. Your stay isn't just a retreat, relax and recharge for you, it also enables employment and training for locals and, through The Island Foundation, a positive impact even beyond Nikoi’s immediate communities, with education, arts and crafts retail, sports and cultural preservation programmes. Accommodation: The 15 villas of various sizes were all constructed solely from sustainably sourced driftwood, some into furniture which was all made on site, unfinished wherever practical or just finished with natural oils and waxes. The villas are designed to encourage air-flow with master bedrooms raised off the ground and vaulted ceilings, so as to avoid air conditioning and minimise energy consumption and noise pollution: There’s no televisions, dvds, telephones or mini bar fridges, and fans keep guests cool at night with low voltage LED or CFL lighting, plus minimal recycled cooking oil tiki lamps along pathways so as not to disorientate nightlife such as nesting turtles. Solar panels provide hot water and create an excess of energy for battery storage so that the generators can even be switched off 12 hours per day. Even the salt water pool is topped up by water rejected from the desalinated water used for hospitality: everything possible is recycled, reused or upcycled, such as the car tyre flip flops and rice bags souvenirs in the shop. 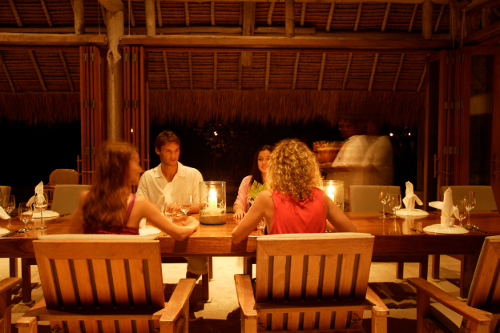 Meals can be enjoyed in the privacy of your own beach house, the clubhouse restaurant or under a shady tree on the beach. The menu is fixed – to reduce food waste and focus on seasonality – homemade, naturally organic, complying to guidelines, such as WWF sustainable seafood, with barbecues prevalent and tropical fruits, including in the head barman’s infamous piña coladas and margaritas. Bars: There’s a beach bar, sunset lounge and a pool bar. But don’t expected plastic bottles and straws - those are banned – rather, Nikoi carbonates their own water, provided in reusable glass bottles, with heavenly organic natural syrups for flavour should you wish, and drunk with bamboo straws. Activities: Whether you want to relax or be active, there’s a lot to do on a small remote island! 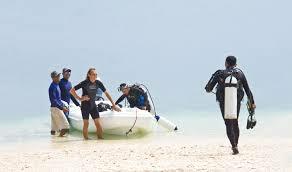 Other outdoor activities include kayaking, kite surfing, trekking, rock climbing, sailing, Stand Up Paddleboard, surfing, windsurfing, snorkelling and diving. 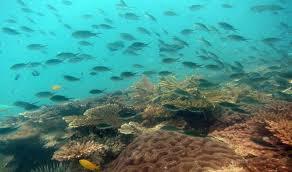 Diving: Nikoi is part of the Sunda shelf with a relatively shallow maximum depth of 20m and healthy coral reefs. Strong currents encourage the growth of hard and soft coral gardens but mean diving can be murky and not for the inexperienced; qualified staff can act as buddies or guides to qualified divers. Turtles, stingrays, seahorses, bat fish, cuttlefish, octopus, sweet lips are regularly spotted plus occasionally unusual species of starfish and puffer fish. There are 60+ staff resident on the island. All of the staff working for Nikoi except for the General Manager and the Marine Conservation Officer are Indonesian. Many started working with Nikoi during construction and have gone on to learn new skills to work in front of house roles. There is great investment in staff training in areas as barista, rock climbing, mixology, scuba, nature, sailing, windsurfing, tennis, cooking, first aid, life saving and wine. As a result, Nikoi has a very high staff retention and loyalty, which translates to great guest experience of experienced staff. Supplies are almost all bought through local markets and small traders, avoiding the middle man where possible, to benefit the local community and the guests with local fresh non-processed organic produce. Nikoi has also helped establish local businesses, such as car hire and alang-alang (ylang ylang) supplier for grass roofs, likewise beneficial to the community, operations and guests. Through The Island Foundation, Nikoi has also supported the local Orang Laut people and their cultural identity. One project has seen their traditional fishing net sewers introduced to jewellery making, and the creation and exhibition of a Swarovski crystal fishing net, displayed at the National Museum of Singapore in January 2015. An exclusive (in addition to the other guests and staff) experience, adventure and exploration in First World Robinson Crusoe style. 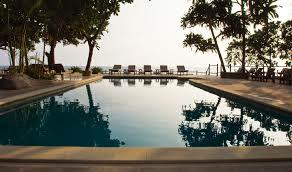 Nikoi’s raw luxury almost seems effortless, such is the experience of its unspoilt natural environment and construction. But Andrew Dixon and co-founders have put a lot of hard work into building, operating and developing Nikoi along strict sustainable principles from the outset, for low-impact, close connection to the environment, nature and community. Regular surveys of the island’s flora and fauna (land and marine) including nesting turtles protection programme are conducted by external consultants, feeding into information guides in each guest room, along with explanations on the environmental and Corporate Social Responsibility policies. Since 2011 a full time Marine Biologist has surveyed the surrounding reefs and marine habitat and a proposal has been put forward to establish a Marine Conservation Area including a No Take Zone to protect the area’s most valuable resource, locals’ livelihoods and stimulate opportunities for the economy, marine sector and tourism. And there’s a vision beyond guest stays, formally registered as The Island Foundation charity in 2010. It’s an independent organisation run for impact beyond Nikoi’s immediate communities, creating education centres and programmes in which over 500 children, plus adults and businesses totalling over 8000 local villagers have benefited. The Island Foundation has established a retail brand (Kura Kura) to help sell arts and crafts as well as the first organized sports program on Bintan for children, the Foundation providing coaching staff, equipment on buy back scheme and ground maintenance. It’s also played a key role in protecting the local Orang Laut sea nomad community and culture. Nikoi also supports the local traditional jong (model sailing boats) race twice a year, which helps to generate interest from younger generations in this coastal cultural event. - From Singapore’s Tanah Merah ferry terminal take a 45 minute ferry to Bintan. The ferry terminal is 10 minutes from Changi International airport or 30 minutes from the city centre. - Nikoi drivers pick you up through VIP clearance & take you 1 hour to a ferry on the east of Bintan. - From there, it’s 10km and less than half an hour to Nikoi on the island’s 48ft boat, with Bintan and Nikoi in view for the whole journey. Rates Please note, Nikoi Island gets booked up usually over 4 months in advance! Most popular months are March to November; some prefer slightly cooler December to February. - SGD$830 for the three bedroom beach house. Meals are charged at a daily rate of S$95 per adult and S$45 per child (under 4 years, free). Prices valid till 30 June 2017. Additional charges apply if guests catch non-designated ferries and a slower boat may be used. Terms & Conditions: Cancellations must be notified 14 working days prior to arrival. Later notice of cancellation or curtailment of arrival or stay will be charged 100% of the total booking value. Member of The Long Run aiming to achieve Global Ecosphere Retreat status, recognised by the Global Sustainable Tourism Council.